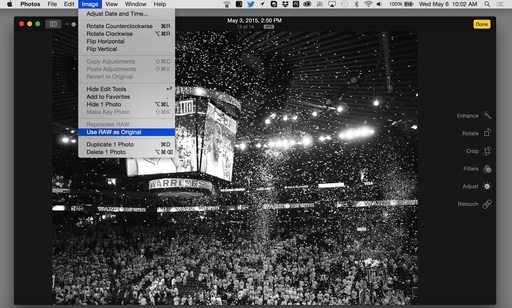 In editing mode, you can tell Photos to switch to the RAW file. Most photographers will want to edit the RAW file in post production. You can tell Photos that you want to work on the RAW by following these steps. Double-click on the thumbnail to enlarge it, then click on the Edit button in the upper right corner. Go to Image > Use RAW as Original. Edit as normally, then click the Done button. You'll notice that when you go back to thumbnails, the badge will now have an "R" on top instead of a "J", indicating that the RAW is the working image. You can control these badges by going to View > Metadata and turning on and off the ones you want. 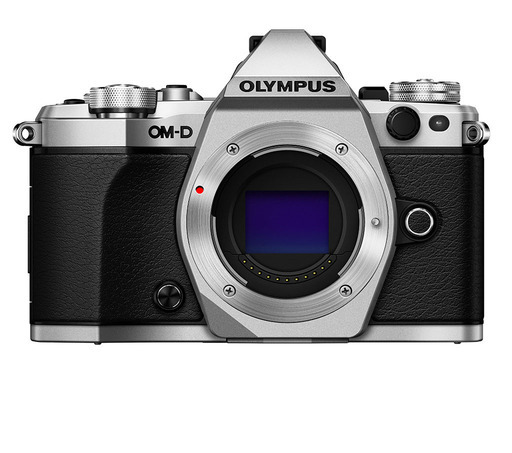 Apple has released Digital Camera RAW Compatibility Update 6.04 that supports 14 new cameras including the new Olympus OM-D E-M5 Mark II, but only for 16MP RAWs, not the 40MP High Resolution Shot files. The cameras on the following list will now have RAW support in Aperture, iPhoto, and Photos for OS X.
I tested the RAW files from the Olympus OM-D E-M5 Mark II in Aperture, and they look great. For most Mac users, the update should have been automatically applied last night. But you can check for yourself by going to App Store > Updates. Happy to see that Apple is keeping our photo software up to date. This week on The Digital Story Photography Podcast: Delicious Monochromes from Your Digital Camera, Shining a Light on the Canon T6 Sensor Issue, Lightroom CC Tip, and One-Step Film Developing (that isn't Polaroid) - All of this and more on today's show with Derrick Story. 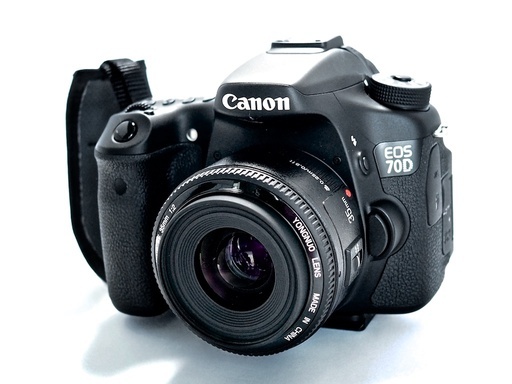 Weekly Update - "Canon T6 Sensor Issue" - Roger Cicla writes, "... 4 of the Canon T6s and 2 of the T6i cameras we received had to be sent back because of a defect in the sensor stack (the layers of filter glass over the sensor). This is out about 10 copies of each; the others were absolutely perfect. 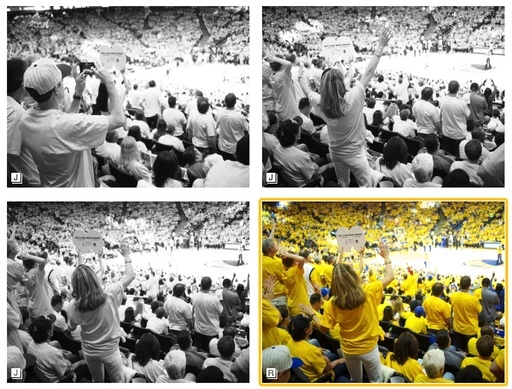 "Warriors Fan, Oracle Arena" by Derrick Story. Story #1 - "Delicious Monochromes from Your Digital" - I've talked about film simulation modes in the past, but some cameras allow you to build your own B&W profiles. 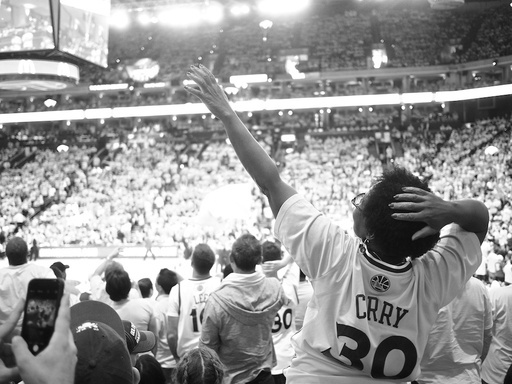 I was "street shooting" again at Oracle Arena on Sunday, but this time in B&W using my own formula. On my OM-D E-M10 (with Panasonic 20mm f/1.7), I began by going to Shooting Menu 1 and choosing Picture Mode. I then navigated to the Monotone option, where I could set parameters for Contrast (+1), Sharpness (+1), B&W Filter (Yellow), Picture Tone (Neutral), and Gradation (normal). I then shot in RAW+Jpeg. The results were beautiful! You can learn more by visiting the Rocky Nook web site. Story #3 - "Reservation Forms Have Been Sent for the TDS Fall Color/Safari West Photo Workshop" - The event begins on the evening of Friday Oct. 23, and it concludes on Sunday Oct. 25th in Sonoma County, CA. If you were on the reserve list, you should have received a reservation form. If not, please contact me. If you want a reservation form, visit TDS Workshops Page and use the Send Me Info form. Story #4 Lightroom CC Tip - Get to Know the New Filter Brush - I've been using the graduated screen much more since Adobe added the Filter Brush. Once you add the screen, click on Brush (in the same box), click on Erase (at the bottom of the box), and paint away the areas you don't want affected by the screen. This is perfect for buildings and trees that stick up into the sky you want to darken. If ever there were a trip where you wanted to balance having the photo gear you need, but not too much of it, it would be a visit to Cuba. 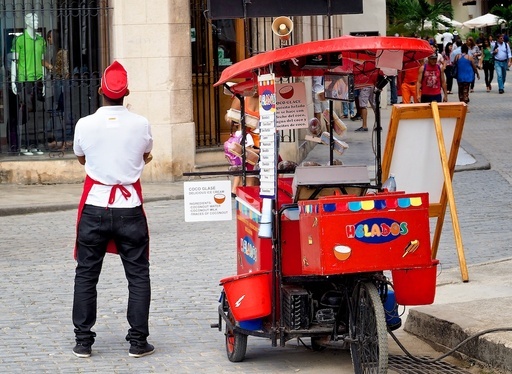 "Cuban Ice Cream Vendor" by Derrick Story. My camera bag for Cuba had a high Nimbleosity Rating. What does that mean? You can learn about Nimbleosity and more by visiting TheNimblePhotographer.com. Composing an image in a crowd of people is challenge. On one hand, there are lots of different colors and shapes. But I believe that every shot needs some sort of focal point. And in a crowd, it's often the person looking back your way. 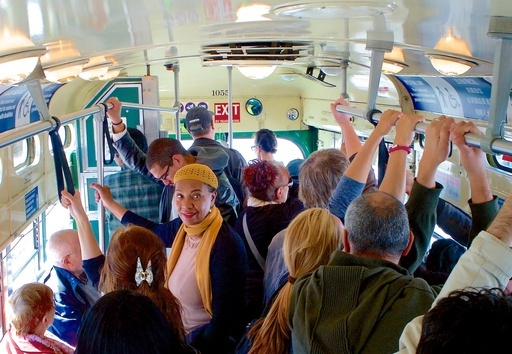 "Riding the F Line, San Francisco" by Derrick Story. This is difficult for some photographers because there are now possibly two people in the mix that know you're taking pictures: you, and the person looking back in your direction. But the compositions are compelling. While the rest of the world is heading one way, there's a single human that breaks away from the herd. And when that happens, snap the shutter. 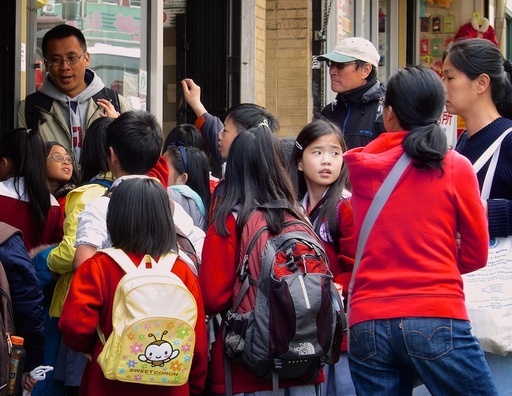 "Children in Chinatown" by Derrick Story"
Most of the time, they won't be looking directly at you (although it's great when they do). It's the disruption in the pattern that's important. It's that single yellow flower in a sea of red that breaths life into the image. So when you're shooting in crowds, look for the person looking back your way. That's usually the shot you'll keep. 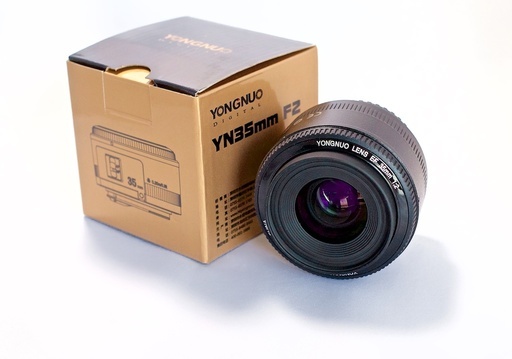 Is the $122 YONGNUO 35mm F2 Lens Suddenly a Collector's Item? When I first read about the YONGNUO YN35mm F/2 lens for Canon, I thought it was a steal for $122. 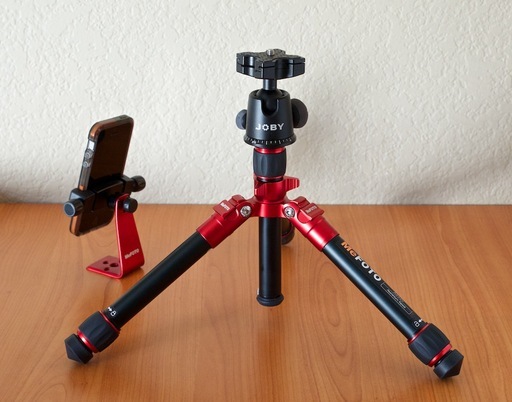 I immediately ordered one and have been having a blast shooting with it. 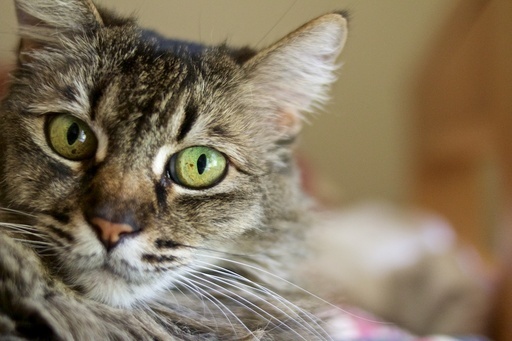 Dibs the Cat - Captured with the YONGNUO YN35mm on a Canon 70D at f/2. The lens definitely has its own look, and an interesting one at that. Photo by Derrick Story. Then, when I returned to Amazon to copy the URL for the TDS Photo Podcast #477, Amazon had this message posted on the site: "Currently unavailable. We don't know when or if this item will be back in stock." The YONGNUO YN35mm on a Canon 70D. Works great. As for the lens itself, I think it's fun. The only oddity so far has been that its EXIF identification is: Sigma A 24-105 mm f/4 DG OS HSM and not YONGNUO YN35mm. This week on The Digital Story Photography Podcast: Hands On with the Yongnuo 35mm f-2.0 lens for Canon, Olympus Camera Grip ECG-2 with Built-In Arca Swiss Plate, SF Street Shooting Workshop Notes, Compositing Photos on a Tablet - All of this and more on today's show with Derrick Story. 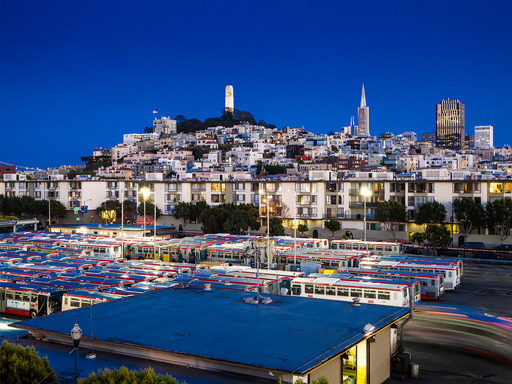 Story #2 - "SF Street Shooting Workshop Notes" I just returned from spending a few days in San Francisco with 8 fantastic photographers. Here are a few of the takeaways from the experience. Story #3 - From the Screening Room - Creating Photo Composites on Smartphones and Tablets with SeÃ¡n Duggan. Sean uses a variety of apps, including Photoshop Touch. You can watch Sean in action by visiting the TDS Screening Room at lynda.com. While you're there, you can start your 7 day free trial to watch all of Sean's movies, plus every other title in the library (including over 20 by yours truly). 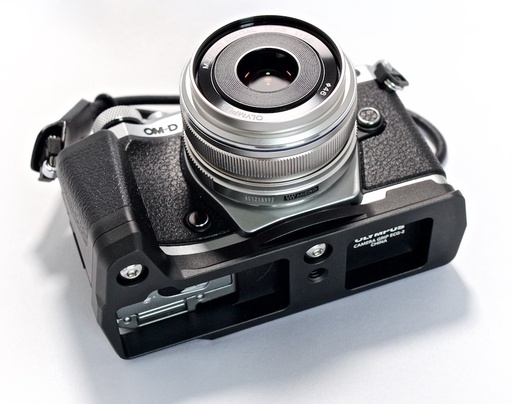 Story #4 Hands on with the Olympus External Metal Grip ECG-2 for the OM-D E-M5 Mark II. This handsome all-metal grip also serves as an Arca Swiss adapter plate. Plus you have access to the battery compartment without removing the ECG-2. I've been running my RAW source files through Lightroom CC's HDR Photo Merge and Google's HDR Efex Pro 2 to compare the differences. I have head to head examples to show you here. San Francisco Skyline - Image processed with 3 RAW source files in Lightroom CC. Photos by Derrick Story. Click on image for larger view. Also, you can see a better rendering of this image on the TDS Flickr page. Lightroom's workflow is an all-RAW process. In other words, you start with your camera's RAW files, and the resulting merge is a DNG that you can process in the Develop module. The advantage to this is that more quality is retained through post production. Take a look at the Lightroom version above. It has virtually no tell-tale edge glow on the skyline buildings, and the overall image is very clean. 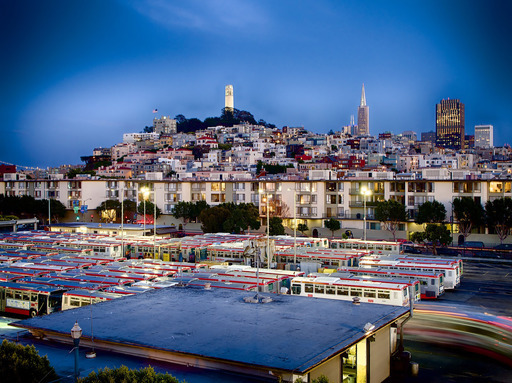 San Francisco Skyline - Image processed with 3 RAW source files in HDR Efex Pro 2. Photos by Derrick Story. Click on image for larger view. When I processed the same 3 source files in HDR Efex Pro 2, the resulting image was more dramatic. But it also included edge glow around the skyline buildings. Now to keep things fair, remember that I made editing choices in both applications to reach the final result. But, in both cases, I was trying to produce the best photograph possible. The opinion I'm developing about both of these applications is this: When I want a more "photographic" image, I'll use Lightroom CC for my HDR processing. I think the overall quality is higher, and there are fewer tell-tale HDR byproducts. However, when I want pure drama, I think HDR Efex Pro 2 delivers the goods. And if necessary, I can clean up those tell-tale remnants in post. Check out my free eBook, Rocky Nook's Guide to HDR and Panoramas with Photo Merge in Lightroom CC that shows you how to create beautiful HDRs and panoramas with the latest Adobe technologies. 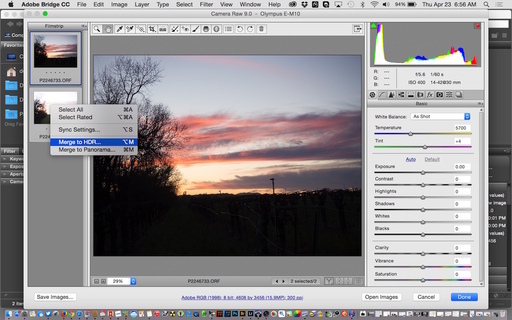 Good news for those who prefer to work in Adobe Camera Raw. 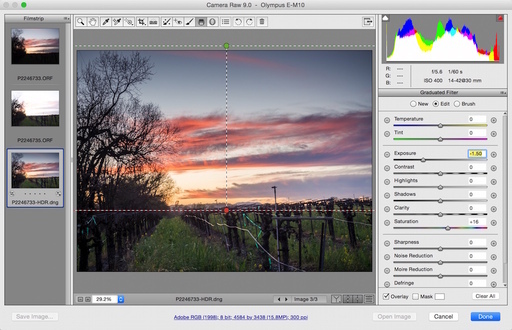 The latest release includes many of the same features as Lightroom CC, including the slick HDR and Panorama Merge. To test this, I selected two RAW files in Bridge and opened them in ACR. (This is the same two RAW file technique that I cover in my free eBook, Rocky Nook's Guide to HDR and Panoramas with Photo Merge in Lightroom CC.) With both files selected in ACR, I right-clicked on a thumbnail and chose Merge to HDR. From this point, the process is very similar to Lightroom CC. A preview is generated, you choose a few basic settings, then click the Merge button. ACR processes the image and places a new DNG file in the same folder as the source photos. From there you can process the photograph as you normally would. In my case I used a graduated screen to add a bit more drama to the sky. Since this is a RAW process from start to finish, you can generate high quality output, and stay within your normal workflow... regardless if that's Lightroom or Adobe Camera Raw.